Learning & Development focuses on continually improving the performance of individuals and groups within an organization. This process encompasses not only formal training in a classroom setting, but informal learning that occurs through mentoring, communities of practice, access to knowledge bases and the use of performance support tools. Moreover, in the past two decades, Learning & Development has embraced the discipline of performance consulting to identify underlying root causes of performance gaps and ensure the right solution is identified to improve individual and organizational performance. In some organizations, Onboarding is included in Learning & Development. In TDRp, Onboarding is included in Talent Acquisition. Additionally, skill gap analysis is often the purview of the Learning & Development function whereas in TDRp, it has been included in Performance Management. In practice, each organization is free to organize their human capital activities any way they choose. We simply need a framework to organize the measures. Each key process like Learning & Development contributes to the achievement of organization goals (for example, a 10% increase in sales or a 15% increase in productivity) and talent outcomes (for example, a 5 point increase in employee engagement or a 2 point increase in the retention rate). Often, talent outcomes are top-level goals of the organization on par with an increase in sales or a reduction in costs. Other times, the talent outcomes are viewed as intermediate goals in support of achieving the top-level goals. TDRp is designed to work in either case. More than 100 measures are defined for Learning & Development. These measures are grouped by type of measure (effectiveness or efficiency). There are five effectiveness measures (the Kirkpatrick and Phillips five levels) and more than 95 efficiency measures which are further divided into seven subcategories. Each organization should choose the measures most appropriate to achieve their goals and manage their human capital. Learning & Development will typically support the broader organizational goals, as well as talent management focused goals. A short summary of each Learning & Development subcategory, including examples, follows. Activity & Utilization – measures regarding the volume of training. Career Development – measures highlighting the use of development plans. Cost – measures regarding the cost of training. Headcount – measures related to the number of training participants. Training Effectiveness – measures related to the effectiveness of training. Cycle Time – measures related to the elapsed time to design and develop training. Effort – measures related to the amount of time to design and develop training. To learn more about L&D measures, preferred definitions, and guidance on their use, go to the detailed, 34-page Definition of Terms and Measures document (members only). CTR members may also access the electronic TDRp Measures Library which includes tier information, but the best source for L&D measures is the Definition of Terms document. A list of measures is available to nonmembers by clicking here. One general white paper Introduction to TDRp and three white papers specific to learning and development are highly recommended (Full White Paper [55 pages], An Overview [18 pages], or Executive Brief [4 pages]) . In addition, there is white paper focused on customer education (Applying TDRp to Customer Education) and a TDRp Self Assessment. All of these can be found under the L&D Resources tab > Tips and Tools for L&D. 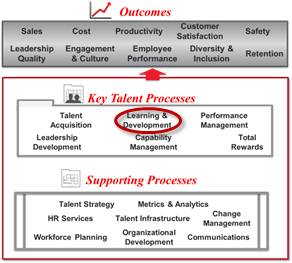 Notes: (1) The other five key human capital processes are Talent Acquisition, Capability Management, Leadership Development, Performance Management, and Total Rewards. Workforce Planning and Demographics has also been included as a key supporting process. For more on the TDRp framework see Introduction to TDRp and Extending TDRp to All Key Human Capital Processes.